ชาวอิหร่าน 1 คน และ ทหารอเมริกัน 8 เลียชีวิต ใน ความพยายามช่วยตัวประกัน. Engelmayer, Sheldon D. (1981). Hostage: a Chronicle of the 444 Days in Iran. New York: Caroline House Publishing. ISBN 0-89803-084-6. Records of the Prime Minister's Office, Correspondence & Papers; 1979-1997 at discovery.nationalarchives.gov.uk: IRAN. 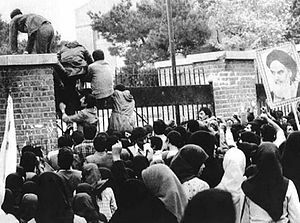 Internal situation in Iran; Attack on British Embassy; Hostage-taking at US Embassy; Freezing of Iranian Assets; US Mission to release hostages; Relations with US & UK following hostage taking at US Embassy. หน้านี้แก้ไขล่าสุดเมื่อวันที่ 6 มกราคม 2560 เวลา 11:20 น.